I know I’ll catch some flak for what I’m about to write. But, as a longtime viewer of NBC Nightly News, I had to point out a slight video flaw that dances dangerously close to an ethical line. Television is a visual medium. It conveys emotion even in ways strong still images can’t. But, sometimes in the effort to find the right video, we can stumble. I think the NBC producers/editors stumbled tonight in their story about Reginald Epps, the Coaling, Ala. firefighter, whose tale of survival has been told by several other national media outlets. Unlike the tornado that claimed dozens of lives here in Tuscaloosa that came through late Wednesday afternoon, some have called the most-documented storm ever, the pre-dawn tornado that struck Coaling was NOT caught on tape in Coaling. In Lester Holt’s piece tonight, the producers used “cover video” of the evening tornado in Tuscaloosa. Isn’t that a bit misleading? In his narration, Holt described the Coaling tornado as the “first of many that day” as they showed Chris England’s famous video of the afternoon tornado. As a middle school kid wanting to do TV news, I watched Lester Holt as a local anchor at WCBS-TV Channel 2 in New York City. He’s a class act. At one time, Holt was known as “the most visible African-American newsman in broadcast television.” But, this video issue spoiled what could have been another one of his great examples of broadcast journalism. In the haste to tell great stories when we need good video, we as broadcast journalists have to be especially careful that our images are always telling the WHOLE TRUTH. I had heard Reginald Epps’ story earlier this week on National Public Radio’s Morning Edition and read it in the Wall Street Journal. It was also reported on Web site like The Daily Mail. Nightly News’ story showing Holt at Reginald’s bedside here in Tuscaloosa’s DCH Medical Center— one African American father to another African American father– was the best of the bunch. It tied together the morning and afternoon tornadoes and the experiences of those (both doctors and patients) who went through both storms. It’s a shame that the video editing was a little sloppy. Am I being nit-picky? Yes, probably so. But, I download Nightly News in my iTunes feed almost every night. Elsewhere, I’ve praised the show’s producers when they’ve gotten it right. Because of a poor video choice, this story wasn’t one of those times. Author George DanielsPosted on April 30, 2011 April 30, 2011 Categories Journalism, severe weatherTags Ethics, Lester Holt, NBC News, NBC Nightly News, Reginald Epps, videoLeave a comment on Did NBC Nightly News Mislead with Tornado Video? Tonight marks Day 3 of the national media coverage of the worst natural disaster since Hurricane Katrina– this week’s tornadoes that swept away entire neighborhoods in several Southern states, including Alabama. A day after coming here to Tuscaloosa to see firsthand the devastating blow our community has taken in Wednesday’s tornado, President Obama challenged those at the White House Correspondents Dinner to not forget about the story of recovery that is just beginning here and in communities in Mississippi, Georgia and Tennessee. Yet, I can’t help but wonder how long the networks will commit the resources to cover the aftermath of this latest tornado outbreak? After Katrina, NBC and several of the other networks set up special bureaus in New Orleans. NPR did follow-up stories for months after the devastating floods. When will the national media move on to the next big story and spotlight shift from West Alabama’s commercial center? Last night the crews from NBC produced a one-hour special of its award-winning Dateline NBC that set the tone for kind of “documentary-type” examinations of the deadly tornado outbreak this week. Despite a lead package from one of my favorite broadcast journalists, John Yang, NBC had one glitch– a video mismatch in one of its pieces on storm victim Reginald Epps. FULL DISCLOSURE: I am a supporter of Billy Graham Evangelistic Association. I’m sure The Weather Channel will be doing something in the form of a “Storm Stories” type of presentation on the disaster that was this week. The most well-known personality at NBC’s sister cable network, Jim Cantore did a short update from here in Tuscaloosa on Saturday night. National News for the Long Haul? But, the long-term, consistent updates, the things that keep this story on the minds of Americans, is what is sorely needed. It’s the kind of journalism that I want to see, and perhaps get involved in myself. We’ll see what happens in the next 72 hours. As the University of Alabama reopens Monday, the emotional toll of this tragedy begins to be felt by those who are helping out, the funerals and memorials services of the dozens of victims take place, we’ll see what the national media decide to do. Author George DanielsPosted on April 30, 2011 April 30, 2011 Categories Journalism, severe weatherTags CNN, Dateline NBC, John Yang, Lester Holt, NBC Nightly News, Obama, The Weather Channel, Tuscaloosa Tornado, White House Correspondents DinnerLeave a comment on TV Networks’ Big Decision: When Do We Leave? It’s now 7 a.m. in the Central Time Zone and literally the whole world is waking up to what happened here in Tuscaloosa yesterday. After my earlier blog list, celebrating the return of electrical power to my home, I got a call from the British Broadcasting Company (BBC). Joined by a University of Alabama student, James and another resident of Birmingham, (that would be the largest city in Alabama), we took questions about asked to share our perspectives on what happened. The conversations about the tragedy of a tornado are different from the news reporting of death tolls, street closures and relief efforts. Right after the BBC Interview, I went on to talk about the situation on John Hockenberry’s The Takeaway. which airs on WNYC here in the United States. The pictures taken along the roads like Veterans Memorial Parkway or McFarland Boulevard might give the impression that the entire town was leveled. This is not a small town with one traffic light. As the commerce center for West Alabama with more than 80,000 residents, Tuscaloosa City and County are largely intact except for tree damage. The parts where the storm hit are heavily damaged or destroyed. Those of us talking to the rest of the world have to convey these finer points. It’s hard to believe, but for those of us who live in this neck of the woods. we know how to prepare for a possibility of severe weather. The University did that. The local meteorologist told us two days in advance that Wednesday would be a rough weather day. The local schools closed in anticipation of the severe weather warnings. in a breaking news situation, especially driven by tweets and text messages, it’s important for those of us on the ground to be the source of accurate and reliable information. The day, Thursday, April 28, 2011, the day after a devastating tornado ripped through the commercial center of West Alabama– Tuscaloosa. Thanks to a battery-operated cassette radio that I’ve had for more than 25 years, I was able to stay in touch with the outside world. D-batteries and my radio got me through the last 9 hours. Well, I slept about four of those hours. But the restoration of power to my home makes all the difference. For hundreds here in Alabama, that is not the story. It was expected,. It was anticipated– bad weather, severe weather. But, you have to understand the threat of severe weather is not an uncommon occurrence here. A tornado that goes down one of the busiest east-west thoroughfares in town– that is uncommon. While I lament the inconvenience of being without power for 9 hours, I pray for those families who’ve lost their loved ones, their homes, their life’s belongings. As the morning news cycle begins shortly, it will be interesting to see how the world sees this college town, the epicenter of the devastation that has affected so much of the Southern United States. I thank God for sparing my life. Now I must know I’ve been spared for a reason– blessed to be a blessing to someone else. If you haven’t seen it– you should read A Hole At the Bottom of the Sea, the first major account of the nation’s worst environmental disaster, the Deepwater Horizon Disaster than began a year ago this month. This summer, I will be on the team of journalists taking 18 high school students from seven states to the Gulf for an intensive team reporting experience a year after this major environmental and political story. This afternoon, The Alabama Pro Chapter of the Society of Professional Journalists sponsored a 30-minute talk with Joel Achenbach about his book on a new program, Studio SPJ. It’s a podcast that is produced LIVE . According to Achenbach, what made the Deepwater Horizon incident such an incredible story was not just the unprecedented nature of the environmental disaster, but the lack of a similar experience on which journalists could depend to know how to cover the story. But there were no routines for this story, which really became national news about 8 days after the initial incident. 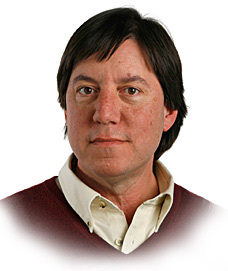 Achenbach is an acclaimed science writer for National Geographic and more recently has become a veteran reporter and blogger for the Washington Post. He says his book is as much about crisis management with politics as a sub-plot as it is about the long, tedious tasks of scientists trying to plug a leak. The interview was conducted by Alabama SPJ Pro President Dennis Pillion, who himself spent some time covering the oil spill for al.com. I came away from today’s talk with Achenbach with a lot better understanding of what was going on behind the scenes and what directions we should take in our “one-year-later” journalistic efforts this summer. 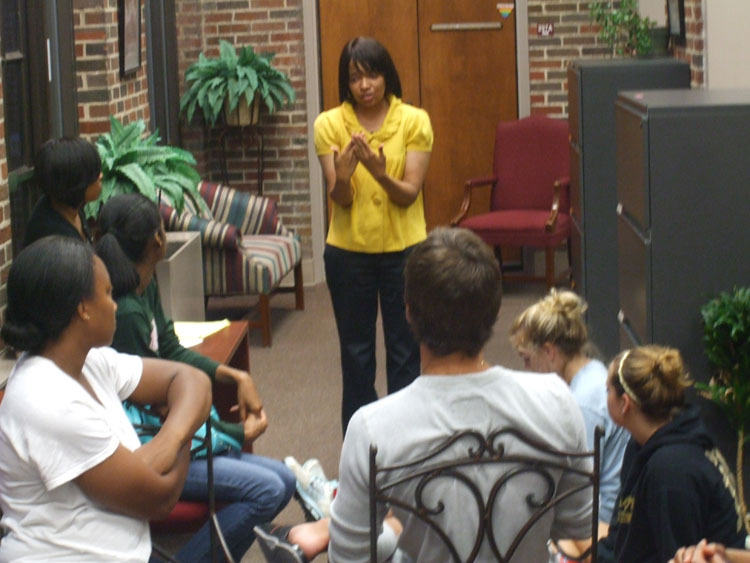 Birmingham News Interactive Director Staci Brown Brooks addressed students Wednesday night at the Capstone Association of Black Journalists Meeting at University of Alabama. She may have been at The Birmingham News for nine years, but not until tonight has University of Alabama alumna Staci Brown Brooks been in the position to return to her alma with the stature of one who’s on the cutting edge of multimedia journalism at Alabama’s largest news operation. As director of interactive content for what has historically been Alabama’s largest newspaper (recently multimedia organization), Brooks is now carrying a cross-platform message about meeting readers of The Birmingham News wherever they are giving them their news whenever and in whatever format they want it. Like no other year, 2011 has been one where The Birmingham News has been viewed/consumed in more platforms and formats than ever before, the latest of which is a successful iPad app commemorating Auburn University’s national championship. Brooks carried around her MacBook Pro, an iPhone and an iPad as she visited UA students in classes this afternoon and gave a talk tonight to the Capstone Association of Black Journalists. Her visit to the same campus where she studied journalism back in the 1990s, comes just four month after The Birmingham News launched its “This is Our Story” marketing blitz. Tonight she told that story to a multicultural crowd of students attending an organizational meeting for the University’s affiliated of the National Association of Black Journalists. Students in journalism, public relations, advertising and other areas of communication listened closely as she talked about some of the News’ latest digital successes. 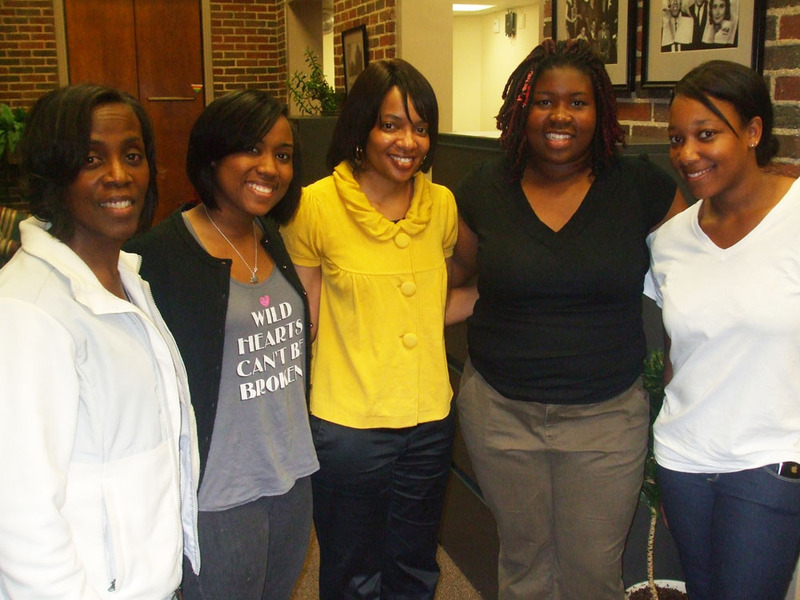 Staci Brown Brooks (Center) paused for a quick group photo with Capstone Association of Black Journalists leaders. They are Caryl Cooper (adviser),Amber (President), Amethyst Holmes (Vice President), and Jasmine Williams. As a 1998-99 Chips Quinn Scholar, Brooks is one many journalists of color who are setting the standard, often as trailblazers in their roles in the nation’s newsrooms, for excellence in our profession. These days instead of just reporting or working on the copy desk, Brooks is spending her working hours developing concepts for iPad apps and ways to capitalize on traffic on the al.com Web site, which is The Birmingham News home on the Web. 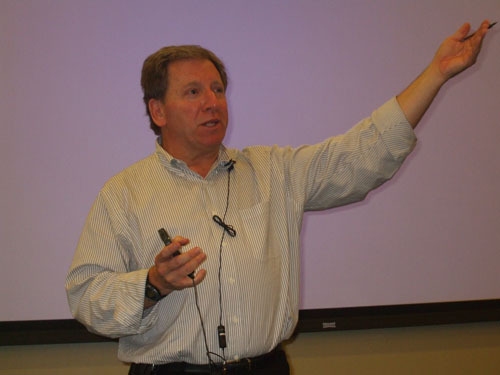 He’s analyzed every congressional race in the nation since 1984, but until this week National Public Radio’s Ken Rudin had never step foot in the state of Alabama. After a stop in Montgomery where he visited Southern Poverty Law Center Founder Morris Dees on Monday, the self-proclaimed “political junkie” brought his decades of wisdom here to Tuscaloosa to the University of Alabama campus for a lecture sponsored by the Honors College and UA’s Housing and Residential Communities. Rudin recalled how the late Former Governor George Wallace was making headlines “when he was a kid,” but that in all of his years following electoral races he had journeyed to Wallace’s state. With just about six weeks to go until Rudin’s latest project, Impact of Government, launches, the former ABC Newsman took his fellow journalists to task for not covering the stories that really matter, especially when it comes to events in government. “The stuff that affects people is what journalism really should be about,” he said. Starting in June, NPR will officially roll out a multiyear initiative to put additional state level reporters to work in 50 states over the next three years. After his lecture, Rudin showed University of Alabama students and faculty pictures of some of the hundreds of political campaign buttons that he's collected over the years. While this new Impact of Government initiative launches, Rudin hopes the new broadcast and digital reporters hired will not be like many he says are in the profession today. “Journalists are lazier,” he said as he noted how many newspapers have suffered layoffs in recent years. He noted that there are more cases of plagiarism than ever. 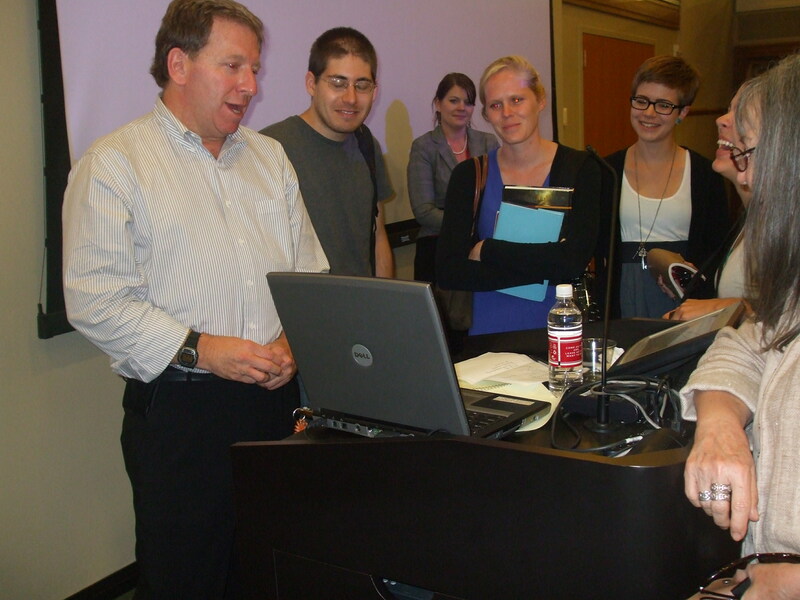 “It’s just remarkable who they have on TV now as pundits.” Rudin told the students.